#picturefiction #flashfiction Thank you to my friend Laurel Hill for the inspiration by her picture from the beach. Marta’s mother had raised her with tales of romance and love. Tales of dashing princes coming from the sea who swept fishing village maidens away from their poor existence to lives of splendor and joy. Marta’s father always stressed that the sea people were untrustworthy. No good could ever come of treating with “their kind” as he referred to the sea people. To follow the sea people was to invite pain and death. Fishermen visited the sea but always returned to their proper place in their village; sea people visited the land and also always returned to their proper place. Nobody was so foolish enough to believe that one people could ever exist in the other’s domain. Marta knew better than any what the sea people were like becase at the age of six she had met Fren. Fren was playing where the surf washed against the sand. He was a slim, pale child like all the sea people. He was the first of his kind that Marta had ever seen. With a child’s fearlessness she engaged the boy in splashing battles, building sand castles, and all the games children had pursued at the beach since time immemorial. Fren returned every summer to play with his new friend. He and Marta would spend hours each day chasing each other along the edge of the surf. At the age of 10 Marta showed Fren how the people of her village fished with long rods made of reed. At the age of 12 Fren brought a dozen different starfish to educate Marta about the diversity of life beneath the waves. Their bond was so close that no one could ever have convinced them to separate. Marta knew more about the lives of the sea people than anyone in her village but she held her knowledge in secret. Many of the men hated the sea people and would use her knowledge to harm them; she could not risk Fren’s safety. In the long months between Fren’s visits, Marta dreamed of the sea people. She imagined castles of coral with seaweed flags. Beautiful men and women strolled the streets of the sea people’s town and danced with colorful fish in the town square. She knew that Fren was not a prince from her mother’s stories; he was a simple boy from a poor family, much like her own. When she thought of him her heart would race and warmth spread through her body; she knew she was in love with the boy from the sea. In her sixteenth year Fren met her as always at the edge of the sea and held out a single rose. Marta felt afraid. Her father’s warnings rose unbidden in her mind. She feared losing all she had known her entire life: her village, Mother, Father, family and friends. She fled from the shore without a word. Each day Fren appeared in the surf waiting for her with a single rose and his request and each day Marta fled; but each day she hesitated longer before fleeing. On the last day of summer Fren appeared once more, a single perfect rose held in his hand. Marta could not bear to flee from him. She had loved him since the day she had met him. She loved his pale smooth skin, his golden eyes and his flowing hair which constantly moved as if shifted by the sea. His easy humor and tales of life beyond the fishing villages warmed her heart. Crying with her love she nodded yes and rushed into his embrace. Fren’s lips tasted of the sea as they kissed and together they moved away from the shore. Marta’s mother came to the beach as the sun was setting in search of her wayward daughter. The girl spent so much time playing at the beach that she worried that the girl was never going to become a proper fisher-woman. She searched all the hidden spots and secret grottoes but Marta was not to be found. At last she stumbled across her daughter’s footprints in the sand and followed them. Down the beach they led, far from their home until they ended at the surf. No footprints exited the water and the only sign of her daughter’s passage was a single rose lying on the sand. 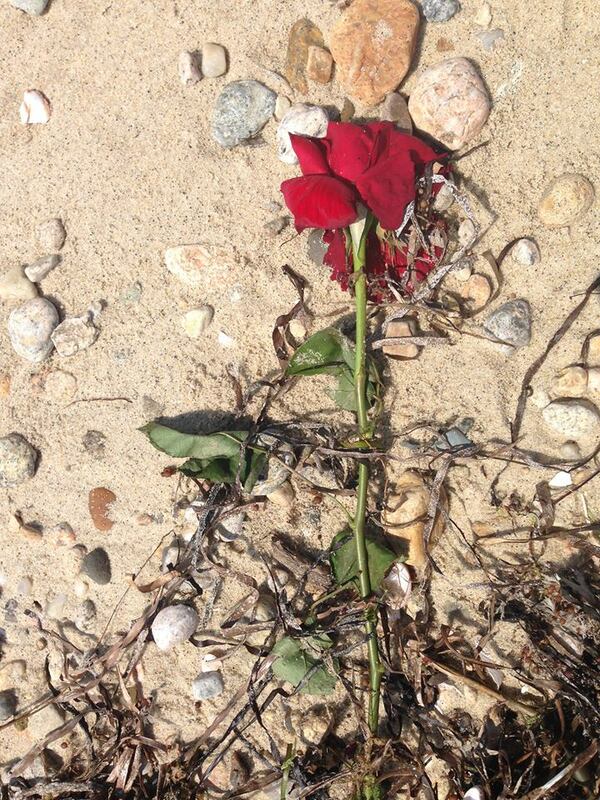 The rose was battered by waves and tangled in seaweed but somehow it was beautiful. The fairy tales she had told her daughter rose in her mind and she knew in seeing this rose that Marta had left them to pursue her happily ever after. This entry was posted on August 18, 2018, 8:00 am and is filed under FREE Fiction. You can follow any responses to this entry through RSS 2.0. Both comments and pings are currently closed.